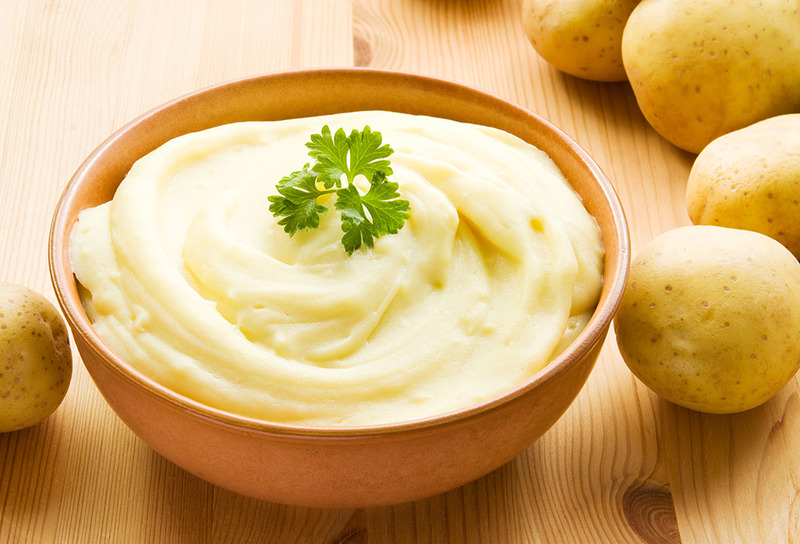 Tasty, quick, easy recipe of potato purée (mashed potatoes) in microwave oven. Cooking time for the potatoes: about 10 minutes. Peel, wash and dice the potatoes. Place the diced potatoes in a dish (glassware) with a lid. Add enough water to cover the potatoes. Cover and boil at HIGH (100%). Cooking time is 10 minutes. Potatoes should be tender. Drain the cooked potatoes, cover and leave to stand. Pour the milk into another dish (glassware), add butter and salt, cover and heat for 2 minutes at MEDIUM (50 percent power). In the meantime, mash the potatoes with a press until smooth. Mix the mashed potatoes with the warmed milk and butter and mix well. Tip: season to taste with salt or ground black pepper or freshly grated nutmeg.